Here we have a vintage book that is not a reissue but rather an original that has been unpublished since it was written, oh so many years ago. Those of you longtime readers might remember that a year or so back we did a week of Don Freeman, author and illustrator of the classic Corduroy... the centerpiece of which was thoughts and observations of life with Don by his son Roy (to read the full series of posts, start here). He told us then that he had a collaboration with his father in the works, and this fall, it was finally released. 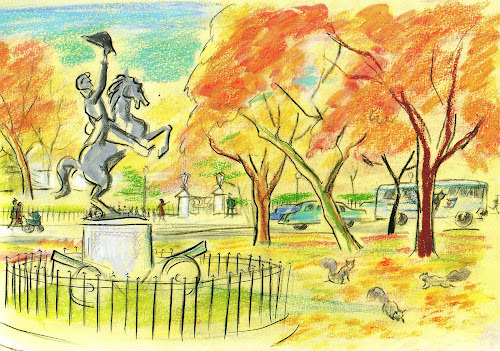 When Don passed away in 1978, Roy was left with all his father's manuscripts and archives and among them was a story about a squirrel in Washington, D.C that Don had begun work on in the 1960s. 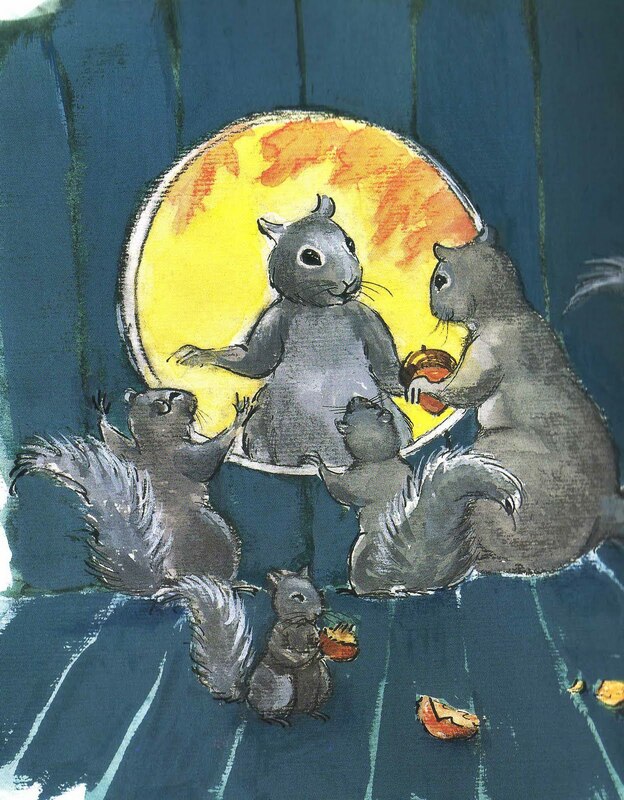 Early one morning in the city of Washington, D.C., a lively gray squirrel named Earl looked out of his tree house door and blinked his eyes. Winter would soon be here, and Earl knew it was time to go and find the acorns he had stored away last summer. It's a beautiful story of family and a lovely portrait of America's capitol (that on this election day is indeed in need of some peace, happiness and love). Some of the story and art were unfinished, so Roy worked with Joy Peskin at Viking and an artist named Jody Wheeler to create words and images that could finish the book and create this unique collaboration between father and son. I can't even imagine how gratifying this project must have been for Roy. I know as readers, we are so lucky to have this never before seen piece of Don back. To be entered to win a copy of this book signed by Roy Freeman, simply comment on this post by 11:59 PM Sunday, November 9. The winner will be announced (along with all the other winners from the week) on Monday, November 10. The Great Holiday Give will last all week, so be sure and check back each day to find out about a new vintage reprint and enter to win a different book. This book was sent to me by Roy to giveaway, but I don't think I need to tell you that this in no way educated my opinion of Don and his awesomeness. 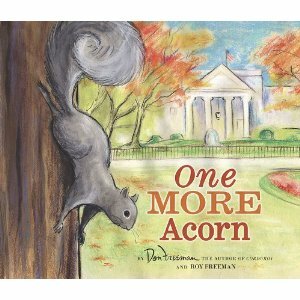 We love Don Freeman, and those squirrels are mighty close to where we live! Thank you! I'd love to add this to our Don Freeman collection! This is one Don Freeman book that I don't have. Please enter me. Corduroy was, and still is, one of my favorites. It is nice to see that there is a 'new' Don Freeman out there. My girls love reading Don Freeman books. I'm sure this will be a favorite as well. Aww acorns are right up my alley. :) Thank you for the chance to win it! Thanks for the chance to win this one! wow! what a treasure! thanks for the opportunity, and thanks for telling about this book. Beautiful illustrations! We have loads of squirrels who spy on us in our studio. OK, if I don't win this one (here's hoping I do! ), I think I will just have to go out and buy it because a) I have been a fan of Don Freeman since before I was born (ha! ), I used to live in Washington, D.C., and I still adore that city (but not so much in August! ), and squirrels are our favorite urban critter. Thanks for bringing my attention to this book! I love Don Freeman books. This book looks great. We don't have any Don Freeman books so this would be a great start to a collection. Thanks for the chance! a squirrel threw an apple at my dog the other day. OK, it let it roll off of the tree, but it still hit my dog. Funniest thing ever; except to the dog. What a treasure this book would be! Thanks for a chance to win! Roy should be proud to complete this work for his father. What a sense of accomplishment! Wow, this is great--thanks for sharing about this. We love Corduroy and squirrels and Washington D.C. too. And signed--what a special giveaway. We just got Norman the Doorman at the library and we love Don Freeman. I enjoyed your Don Freeman week some time ago. I hadn't known much about the author prior to that. We'd be glad to add a copy of this book to our collection. 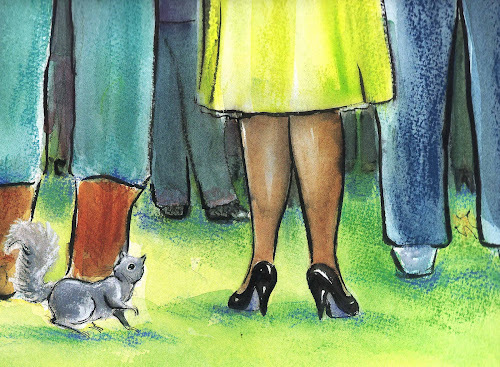 We've fallen in love with Earl the Squirrel. I'd love to see him in the NY setting! This one sounds wonderful! Thank you for the chance to win! OOOh - amazing! My fella and I have a running joke about me being a squirrel... (I'm apparently easily distracted and fidgety :) I don't believe it!) anyway, needless to say we're drawn to all things squirrel! So fingers and crossed for this one! This one looks just beautiful. Thank you! I'm a big Don Freeman fan. I posted on him even when he didn't directly fit in with the blog. We love Corduroy, but I been even more enchanted with some of the lesser know Freeman titles I've found. I'd love to win a copy of this one! This is AMAZING! A new Don Freeman (with the help of Roy)! It looks beautiful. I've always been envious of fall colloring in (parts of) the US. Here (Portugal), we just get brown and yuck. I used to be envious of urban squirrels, too, but then I lived in Texas, and I got over it right quick. Thanks for the chance to win! Love Don Freeman! I have never seen this Don Freeman book. putting my hat in the ring, fingers crossed! Corduroy is one of our favorites so this looks awesome! I'm not familiar with this one, but it looks so sweet and it's the perfect season for it. This would be amazing to own- I love the little snippet I can see here- thank you! Would absolutely love to have this. We think Corduroy is great!. Wow, an unpublished Freeman! Thanks for a chance to win this new release. The illustrations in this book look great.